TAKE TWO MINUTES TO SAVE BIG! IT'S FREE! 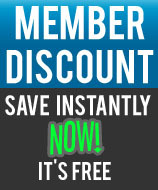 Become a member to receive INSTANT discounts on hundreds of items. Add the membership to the cart and check out, its that easy! Log in to your acount receive deep discounts on hundreds of items in our store. Simply put, WE SELL FOR LESS! Many manufacturers won't allow us to list our unbeatable low prices. If you want to avoid price matching, searching online for the lowest price and paying more for your gear than you have to, then this is for you. It's FREE, there is no obligation and every item we sell that is offered at a discount member price will be automatically shown when you are logged in to your account as a member. You will get our discounted prices on all qualified items for life! To get the sale prices, you MUST be a member and MUST be logged into your account. Generally higher priced items will have greater savings. Many accessories and lower priced items will not show any discounts. Coupons and other discounts still apply even to these member only prices! Bought a Bass ukulele as well as a Banjo ukulele. Both arrived in great shape and appeared to have been well set up. Arrived in 10 days as expected. These are very good quality for such a low price. Who ever set it up did a fantastic job.I need to work out amp settings to get it dialed in but with a new guitar set up so well I'm off to a great start with it. Great sounding mandolin! It made me want to play again. The combo kit was an excellent value. The package arrived safely in sturdy packaging. This new mandolin was as inexpensive as a used one I was considering. Great packaging and was here before the due date..........great job! !